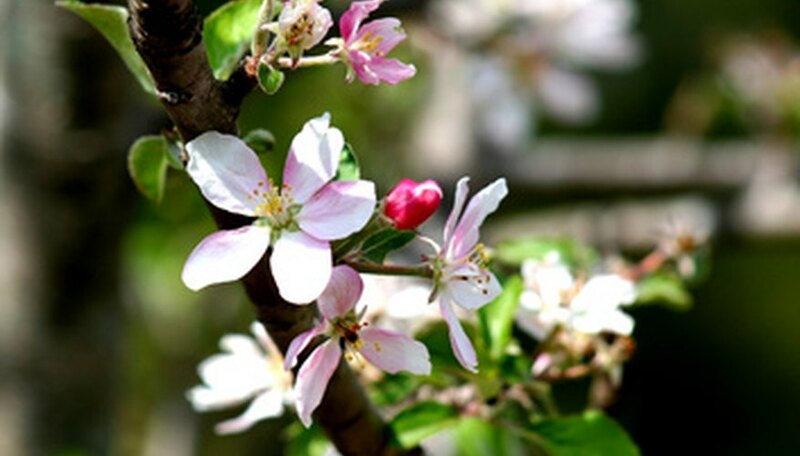 Apple trees produce fruit when the apple blossoms are pollinated. However, according to the University of Missouri, most apple trees need to be cross pollinated in order to bear fruit. This means you need two different varieties of compatible apple trees planted close to each other that bloom at the same time to ensure proper cross pollination. Crab apple trees can also be used as cross pollinators for apple trees, according to Purdue University. Insects such as bees will cross pollinate the trees for you as long as they are planted close enough together. Purchase two apple trees of different varieties or one apple tree and one crab apple tree that are good cross pollinators for each other and that bloom at the same time. You can determine which varieties will cross pollinate by referring to apple pollination and bloom time charts. Plant the apple trees within 50 feet of one another in an area that receives full sun. Apple trees prefer rich soil but will also grow in sandy and clay areas, providing they are well drained. Dig holes as deep as the trees' root balls and two times as wide. Place the roots in the holes and spread them out to be sure that nothing is tangled. Backfill the holes with soil and water deeply. Introduce bees or other pollinating insects into your garden when the apple trees blossom. If you cannot introduce bees into your garden manually, plant more flowers in your yard to attract bees and other insects for cross pollination purposes. Sir Prize, Turley, Stayman, Mutsu and Winesap apple trees are poor pollinators and should not be used as a cross pollination source, according to Purdue University. Hollan Johnson is a freelance writer and contributing editor for many online publications. She has been writing professionally since 2008 and her interests are travel, gardening, sewing and Mac computers. Prior to freelance writing, Johnson taught English in Japan. She has a Bachelor of Arts in linguistics from the University of Las Vegas, Nevada. What Kind of Apple Trees Best Pollinate With Each Other? How Far Apart Should One Plant Peach Trees? What Apple Trees Are Good Cross-Pollinators? Do Pink Lady Apple Trees Need a Pollinator?